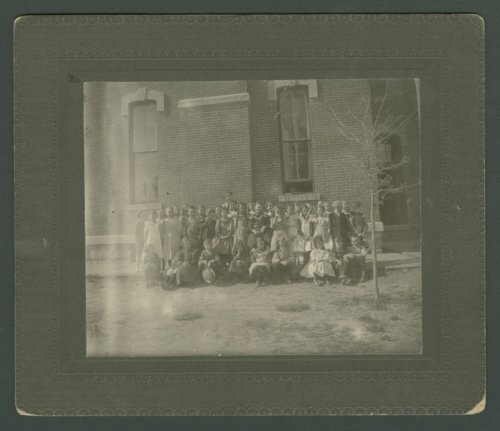 A photograph of a Washington County school, with teacher Ada Ross and students. Listed in this photograph are, front row, third grade: unknown, Amy Thiele, unknown, Paul Thiele, Beele Clarke, Flora Patton, Bert Ledernda, Blanche Barley, Delbert Wells?, Ellsworth Robinson. 2nd Room: Perl Powell, Ethel Webber, George Alolliver, Walter Soller, Gertie Moyer, Edna Hayes, Bonnie Little, unknown, Alta Barley, Amy Thiele?, unknown, Howard Nims, Bessie Lowe. Thrid row back: unknown, unknown, unknown, unknown, Anna Mangle, Nettie blank, Hackney?, Alice Andrews, Gert Boyd, George Hageman, blank Cook, unknown, Alice Correll, Sophrona Willowby, Dewitt Hargis, and Tom Mengle.